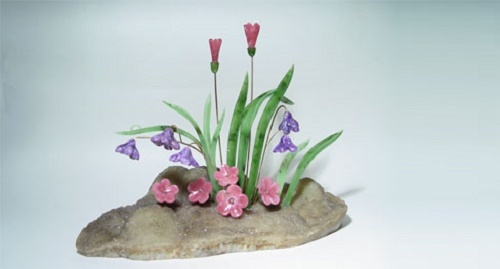 The first bouquet, which stone cutter came up with – a floral arrangement with violets. 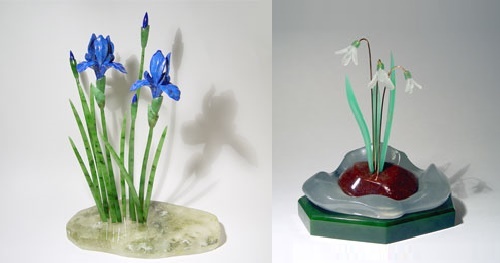 “Violets” – in a vase of agate, and the ground of brown Aventurine, bush violets growing from charoite, with leaves of green jade. Vase with flowers on the plate is made of white jade. Then was developed a sketch of another flower – “Orchid – Phalaenopsis”. 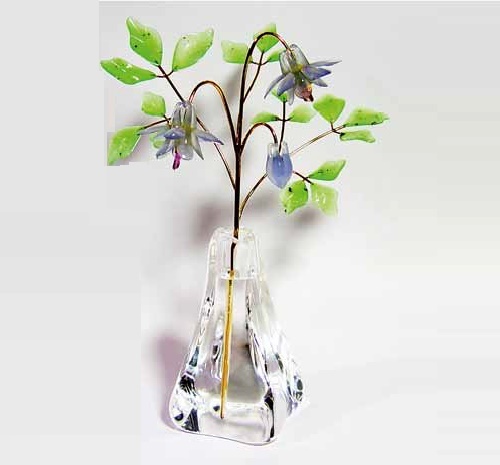 Elegant branch of orchid is in a crystal vase. Orchid flowers are made of white kahalong. In the center of the flower sparkling faceted zircons. Pale green leaves of jade are gracefully curved. 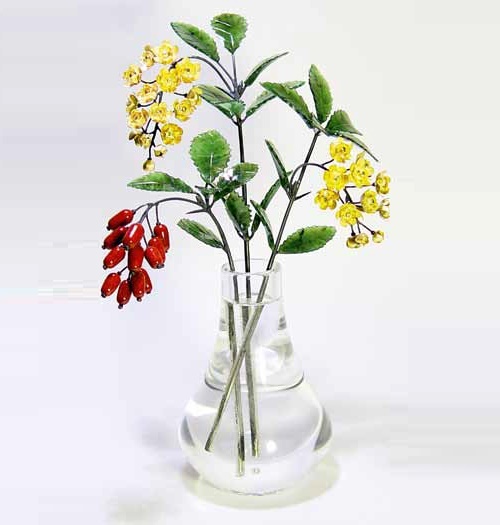 The most ingenious part of this piece is not so much the flowers as a transparent vase. At first glance, it seems half filled with water. 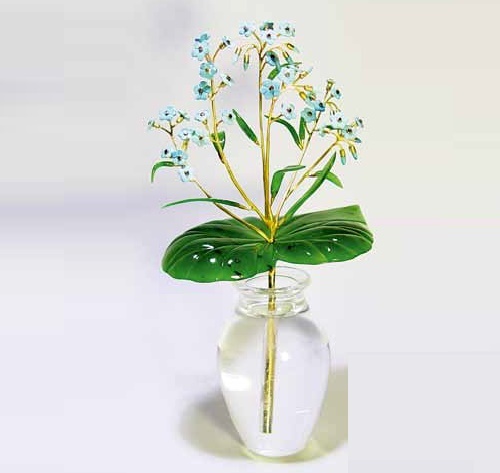 Vase carved from a single piece of rock crystal in the technique of “trompe l’oeil”, which creates the effect. This technical reception was very often used by Faberge, created bouquets came to life and became virtually similar to fresh flowers. 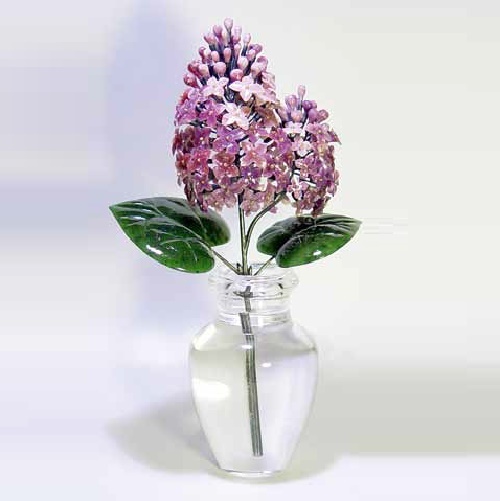 Flower Arrangement – “Currants”, continues the series of flowers in crystal vases. 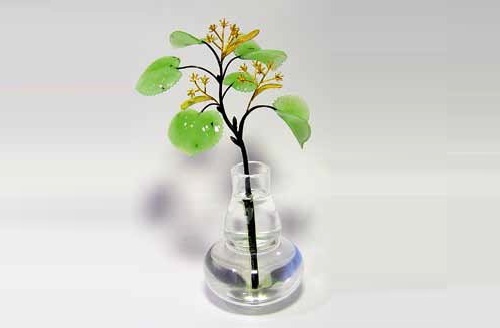 Currant leaves are made of jade, berries of honey – yellow carnelian. Dirty brown spots among the green jade leaves give a natural look.